All bookings run from a Saturday-to-Saturday basis (unless short break arranged). From 3.00pm on the day of arrival to 10.00am on the day of departure. The hirer agrees to ensure, as far as is reasonably possible to secure the property at all times. The hirer agrees to leave the property in a clean and tidy condition. All damages and breakage’s to be reported. Parties limited to 5 persons only. Strictly no smoking inside house. A deposit of £50.00 per week is required when booking the property, with remaining balance to be paid by cheque 4 weeks prior to commencement of holiday. On receipt of cheque, directions and invoice will be sent to you. No booking is complete unless it s confirmed in writing by the owner. 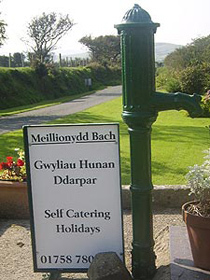 Meillionydd Bach is a working farm please take care at all times. Please call Mrs Lowri Thomas on 01758 780318 for more details.